While losing a tooth impacts your smile's functionality and appearance, you do have a great option to replace it. A dental implant from 4 Dental Health in Layton, UT restores normal appearance, biting, chewing and speech. Also, this artificial tooth improves jaw bone density. Learn more about dental implants from your experienced dentist, Dr. Steven Christensen. Besides creating an embarrassing smile gap, losing one or more teeth impacts your oral health. Remaining teeth actually weaken as they drift into the empty space. Supporting gum tissue and bone begin to recede almost immediately. In fact, a full 25 percent or more of bone density degrades within the first year after a tooth is lost to infection, decay, gum disease or oral injury. In addition, when more teeth or even all teeth are lost, facial appearance ages dramatically, and edentulous people do not eat well or speak clearly. While conventional dentures and bridgework help restore smile aesthetics, they do not repair the loss of bone or soft tissue because these prosthetics only set on top of the gums. A dental implant is today's best artificial tooth. It has three parts: a titanium root which resides in the jaw under the gums, a metal alloy abutment (extension post) and true to life dental crown crafted from resilient and color-matched porcelain. Dental implants adhere to the jaw bone, creating an excellent foundation for the exposed portions of the artificial tooth. In fact, they improve the density, size and width of the supporting bone through a miraculous process dentists call osseointegration. As dental implants are not real teeth, they cannot get cavities. However, gum tissue and underlying bone can develop gum disease--peri-implantitis--if you do not carefully brush and floss every day and get your semi-annual hygienic cleanings (and exams) with Dr. Christensen. Peri-implantitis causes inflammation at the implant site and also mobility of the implant itself, reports the Dental Research Journal. Tobacco usage encourages this devastating infection, too; so getting an implant may be the best time to quit smoking. If you're interested in the many benefits of dental implants, contact Dr. Steven Christensen today at 4 Dental Health in Layton, UT and arrange your personal consultation. Call (801) 889-1044 to speak with a friendly team member. Tooth loss wrecks oral function, personal appearance and self-image. If you're struggling with smile gaps or have lost all your teeth, dental implants from 4 Dental Health in Layton UT could be the perfect solution. Dr. Steven Christensen places these tooth replacements, recreating natural dental function and outstanding aesthetics. Are you ready for a new smile? The International Congress of Oral Implantologists (ICOI) says that the bone associated with a tooth socket degrades immediately after a tooth is knocked out or extracted. Traditional tooth replacements cannot address this problem because partials, bridges and full dentures just rest on top of the gums. The jaw bone underneath receives no stimulation and hence, deteriorates. The titanium metal in the implant device and the bone it resides in bond through a process known as osseointegration. Implants actually exercise the bone each time patients exert pressure on them through biting and chewing. So, over the past 25 years, dental implants have gained tremendous popularity. In fact, the American Dental Association (ADA) reports that American dentists now place about 5 million dental implants annually. In addition, if you use tobacco in any form, try to quit. Both cigarettes and chewing tobacco can lead to a dangerous infection called peri-implantitis. Being similar to advanced periodontitis, this localized bone and gum infection threatens implant retention. See your primary care physician for a medically supervised tobacco cessation program. It has three parts: the implant screw itself, a metal post and a porcelain crown. Multiple implants can anchor fixed partial dentures or full dentures. Either way, osseointegration takes many weeks to months but is so worth the wait. The result is a secure, stable, beautiful smile that lasts and lasts. The Institute for Dental Implant Awareness states that most dental implants remain in place for 4 or 5 decades--essentially a lifetime for most recipients. Contact 4 Dental Health to set up an implant consultation with Dr. Steven Christensen. He'll explain your tooth replacement options and set you on the path to a great new mile. Call today: (801) 889-1044. The gaps in your smile can cause multiple issues with your teeth. However, many people falsely believe that their gap is a permanent addition to their smile. Luckily, your dentist can help you close the gaps in your smile and restore your teeth’s functionality with dental implants. Are dental implants right for you? Find out more about dental implants and how they can help your teeth with Dr. Steven Christensen at 4Dental Health in Layton, UT. A dental implant replaces a missing tooth but does not stop there. It also replaces the tooth’s root, a task that no other tooth replacement option can accomplish. Implants work well in conjunction with other cosmetic or restorative dental procedures to renew your smile and overhaul its appearance. Filling in the gaps in your smile can help boost your confidence and self-esteem to help you feel as great as you look. 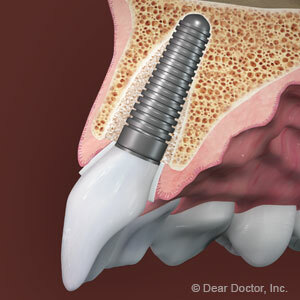 Fixture: The fixture of a dental implant resembles a screw and is made from titanium. 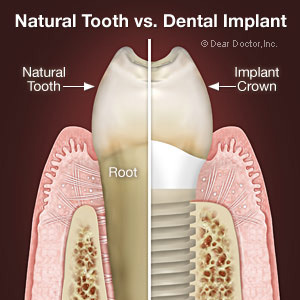 Dentists implant the fixture into the bone under the missing tooth to replace the tooth’s root. Prosthetic: The prosthetic is normally a dental crown custom-made from porcelain. In some cases, the prosthetic is a porcelain dental bridge or even a denture. Abutment: The implant’s abutment connects the fixture to the prosthetic. Some styles of dental implants have an abutment which is part of the fixture while others are separated. Are dental implants the right treatment for me? Dental implants are best for those who are in good dental health and have a committed and healthy at-home oral care routine. Patients should also have minimal bone atrophy in the area of the implant so the implant has an adequate amount of bone in which to sit. Without a sturdy foundation, there is a higher chance the implant will fail and reject from the bone in which it sits. If you have missing teeth, consult with your dentist to learn more about dental implants and if you are a good candidate for this procedure. For more information on dental implants or how they can help you, please contact Dr. Steven Christensen at 4Dental Health in Layton, UT. Call (801) 889-1044 to schedule your appointment with Dr. Christensen today!